The closure and subsequent opening of Boracay have got some island municipalities thinking: How to promote tourism without having to compromise the beauty of the locale? Malamawi Island is one of those communities, except they are not vying to be the next Boracay. 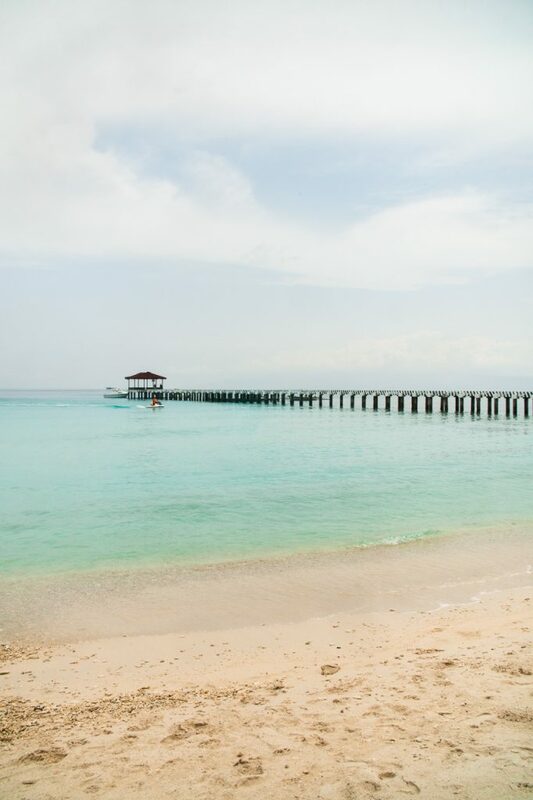 If anything, the locals believe their island is more beautiful with its calm aquamarine waters, and powdery white sand. Sounds like the perfect beach, right? Except that it sounds exactly just like any other beach in an archipelagic nation. Visitors are unloaded meters away from the shoreline from where they can marvel at the beauty of the island from afar. So what is different with Malamawi? For one, despite its paradise-like surroundings, it’s relatively undiscovered and uncrowded. The fact that it is situated in Basilan, a Mindanao territory known for its grim stories of military conflicts and armed rebellions, has kept this island in relative obscurity. 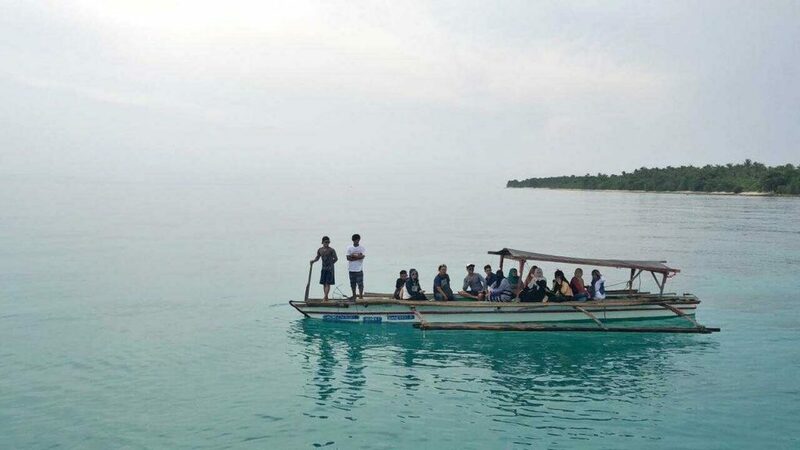 For the longest time, no one from other parts of the Philippines was the least interested in flying down south to an island believed to be inhibited by insurgent groups like the notorious Abu Sayyaf Group. Although there is some truth to that, nowadays the island of Basilan is far from the shadows of its not-so-long-ago insurgent past. Plus, the Malamawi island itself is detached from the rest of Basilan. At the port area in Brgy. Tabiawan, members of the military roam around to keep watch. From there, Malamawi is only about half a kilometer away. It took us about 15 minutes to get there on a speedboat. But there are plenty of other options, including ferries coming from Zamboanga, and outrigger boats from Isabela City port. Inching closer, the waters begin to become clearer with a greenish hue—a tinge brighter than the signature Tiffany blue—through which we get a glimpse of the corals on the seafloor. From afar, a stretch of white sand beach comes to view, as well as the long concrete walkway that starts approximately 100 meters away from the beachfront. As soon as we set foot on the walkway, we realize that it doesn’t only lead into the beach but also separates the rocky waters from the shallows. The island keeps a headcount of 50 arrivals per day. Only those with confirmed accommodation from the Isabela Business Hotel are allowed. It was a Saturday noon but surprisingly there were only a few people frolicking by the beach. We were told the island keeps a strict headcount for visitors (roughly 50 per day). “When Malamawi White Beach became a talked-about tourist destination through social media, there was a sudden influx of people. With them came pollution, as well as maintenance concerns, which the management cannot afford given the very minimal entrance fee [of P25],” one of their tourism officers said. 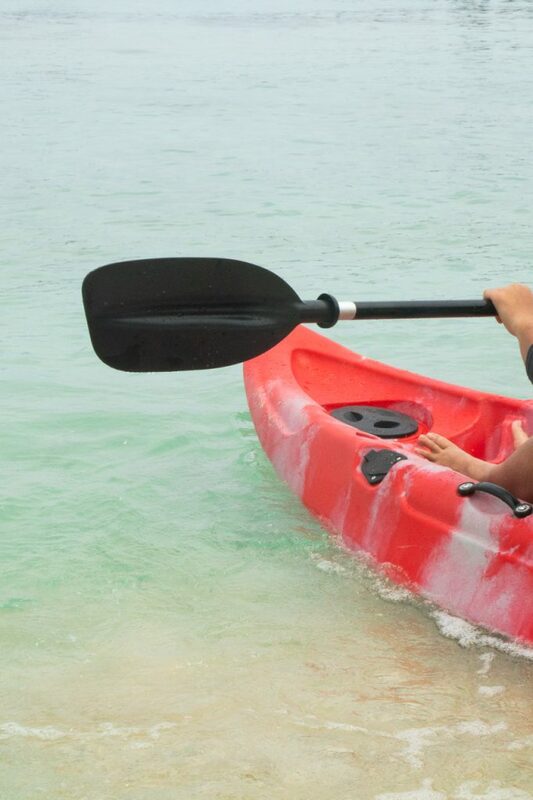 Malamawi beach has daytime activities such as kayaking. The beach, which has been enjoyed by the locals as early as the ’80s, has only recently seen developments in terms of infrastructures and small-scale business. Today, there are cottages strewn along the beach and a few vendors selling refreshments and other sorts of souvenirs and services like rentable kayaks. Doing large-scale development, however, is still far off for Malamawi as basic services such as water and electricity remains a challenge. Private investment is one prospect the local government is looking into. But given other people’s perception of the region, finding interested parties proves to be difficult. But that is the least of the worries of the residents. “Malamawi does not envision itself to be the next Boracay, though its sand and waters can very well compete. There are no grand plans for big resorts and other establishments. We want people to visit Malamawi to enjoy nature, to go there primarily for the beach,” shared a tourism officer. They did admit, however, that they can learn a lesson or two from the story of Boracay in terms of waste management, sanitation, and sewerage, as well as urban planning. Tourism and development come hand-in-hand with sustainable practices for locals especially concerning employment. 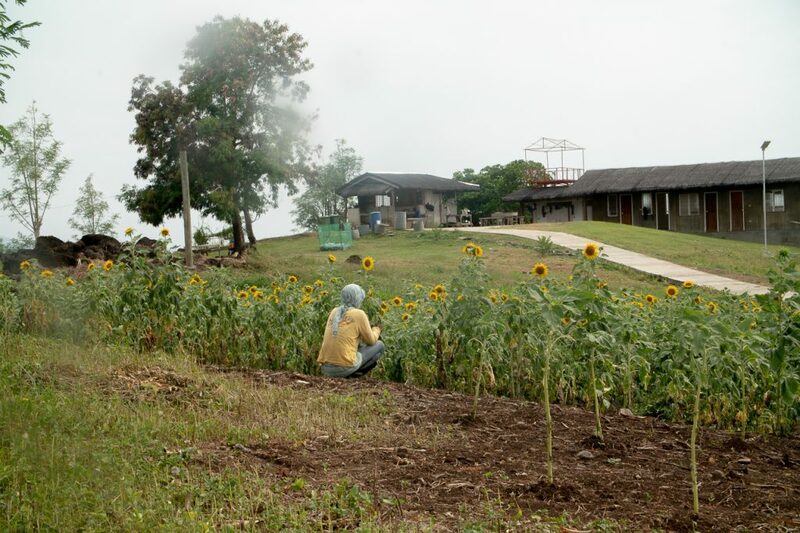 A local tending a field of sunflowers grown on a hill in Malamawi. 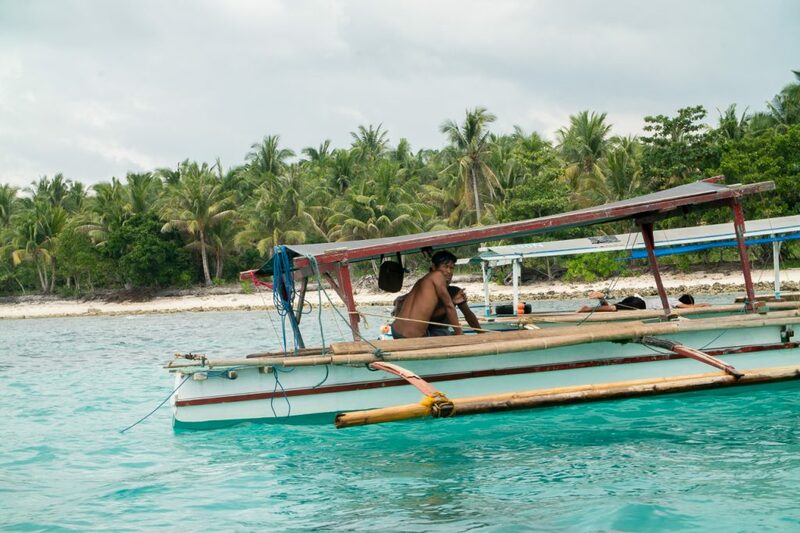 There are plans to put up more attractions like souvenir shops, fishing boats, weaving demonstration, a wet market for fresh catch, all owned and manned by locals, particularly the Bajau residents of the island. Until then, locals can revel in their own paradise, one that they can call their own.